The planet Jupiter will be at its closest to the Earth since 1963, scientists say. This will cause the planet’s appearance to peak at a brightness and size not seen since then. The planet Uranus will also make a close approach, but will be more difficult to spot, as it is much farther away. Jupiter makes its closest approach to Earth in 47 years this week. Image: NASA/JPL/University of Arizona. 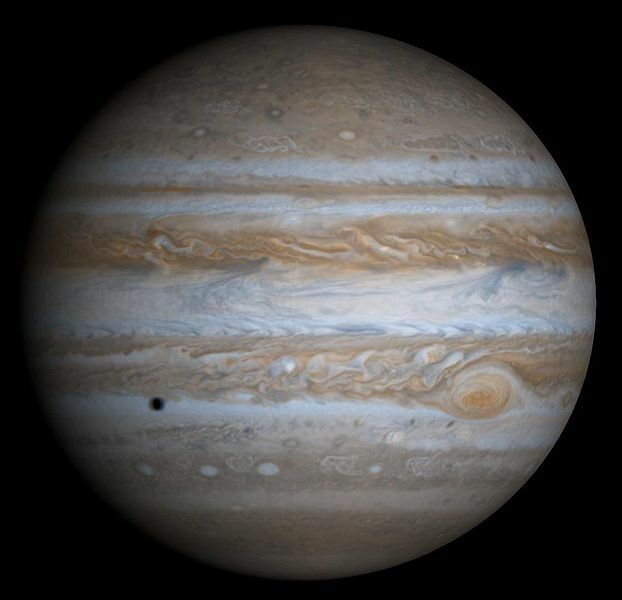 Scientists say that Jupiter will rise at about the time of sunset and will be nearly directly overhead at midnight. The only brighter object that will be in the sky at that time will be the moon. NASA scientist Tony Phillips said “Jupiter is so bright right now, you don’t need a sky map to find it.” It will not appear this bright again until 2022. Jupiter will pass within 368 million miles of Earth at the time of closest approach. Although this will occur on Monday and Tuesday, it will remain large and bright for approximately another month. During this event, the planet will be located in the sky not far from the moon. Some of the planet’s own moons will be visible with the aid of a telescope or binoculars. According to NASA scientists, Earth-Jupiter encounters occur about every 13 months. Since both planets’ orbits are slightly elliptical, meaning they are not perfect circles around the Sun, the distance varies in each encounter. Jupiter, the largest planet in the Solar System, is the fifth planet from the Sun and is more massive than all of the other planets combined, about 318 times as massive as the Earth. Subang (19 September 2010) – Malaysia Airlines moved up one spot to 7th position in the Top 10 Airlines Worldwide category under the Best in Travel Poll 2010 by Smart Travel Asia, a travel magazine for Asia. The Best in Travel 2010 Poll by Smart Travel Asia is about readers’ perceptions on their favourite travel brands. The poll is based on votes from a combination of actual travel experience, word-of-mouth and an idea of the brand drawn from advertising and editorial exposure in the media, primarily online. The poll ran for 3 months from May – July 2010. Malaysia airlines Ranked 7th in The Top 10 Airlines. Voters of the poll took an average 13.56 air trips over the past 12 months and 60 percent are based in Asia, 20 percent from Europe and 20 percent from America with annual household income of USD164, 501. Malaysia Airlines was in 5th place in the category of Top 10 Airlines Cabin Service and ranked 6th in the category of Top 10 Airlines Business Class. Malaysia Airlines Senior General Manager, Managing Director’s Office, Muzzaffar Othman said, “Asia is our main market and we are delighted to receive the recognition as 60 percent of the voters are based in Asia. This will further boost our commitment to provide 5 star value services to our customers. “We are on track for growth and looking forward for the delivery of our new planes starting from this year until 2014. The new B737-800s start coming in from this October. With this, we will be the first airline in Asia and second in the world to receive the new Boeing Sky Interior. This means our customers can enjoy better products and services by Malaysia Airlines. “In addition, we are constantly looking for ways to improve the travel experience for our customers. One of the ways we are offering more convenience to our customers is through MHmobile. This is where customers can purchase tickets and check-in for their flights on the go via their mobile phones. Our latest enhancement of MHmobile allows customers to also view their Enrich miles and the last five flight activities. “Our customers at KL Sentral can also now book, pay, check-in and search for hot deals via the iPad MHkiosk, which uses the MHmobile interference. Our customers are the first in the world to enjoy this kind of service via an iPad,” said Muzzafar. Most recently, the airline was the first in the industry to take advantage of the technology for commercial use with the MHdeals augmented reality application. This provides customers the ability to discover the latest deals and book their flights in a fun and interactive way. Smart Travel Asia Editor, Mr Vijay Verghese said, “The Malaysia Airlines No.5 Rank for Best Cabin Service Worldwide is a very creditable achievement from a field of well over a hundred carriers. Malaysia Airlines was a Top 10 carrier too for Business Class (No.6) and Overall (No.7). With voters polled from all over the world – 20% of them from UK and Europe and 20% from USA – the final tally represents carriers that have a positive brand profile globally and not just regionally. As before, the votes were scrutinized, fraudulent ballots deleted, and the final result represents the “preferences” of global frequent travellers. On reader letters that came in, Malaysia Airlines was frequently cited for its “warmth of service” and the “willingness of cabin staff to go the extra mile”. Malaysia Airlines remains an award winning airlines. It was awarded, for the 6th consecutive year, the 5 Star Airline award by Skytrax, a UK based organization with 20 years experience in airline research. It has also received the accolade of “World’s Best Cabin Staff” by Skytrax over six years, 2001-2004, 2007 and 2009 – the most for any airline. In the World Airline Award 2010, it won 2 awards, the “Staff Service Excellence for Asia” and “World’s Best Economy Class”. It was also voted as “Asia’s Leading Airline” by over 180,000 industry professionals in a global poll conducted by the World Travel Awards in 2009.